In the rocky and arid landscape of the Monti Rognosi Nature Reserve, there were mining activities for the extraction of copper and iron. 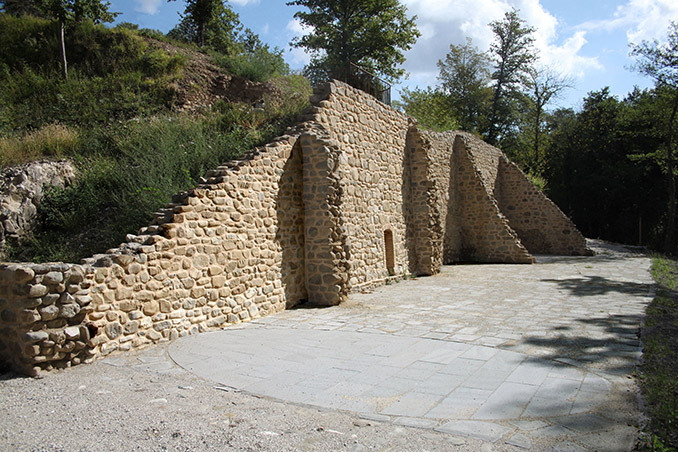 These activities were carried out from Etruscan times to the XVIII century. 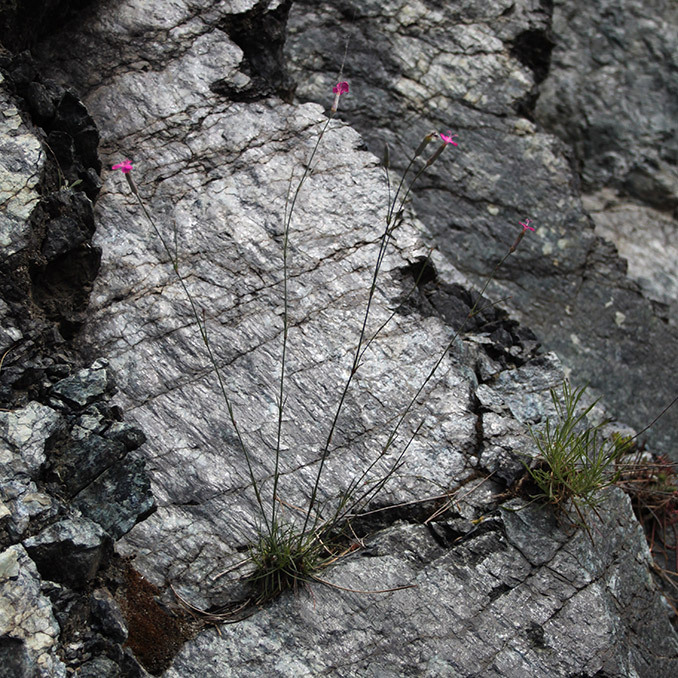 In fact, the system of mountains is made of ophiolitic rocks of magmatic origin, rich in minerals. The serpentinite rock is dominant and its black-green color makes it look like the shiny skin of a snake. 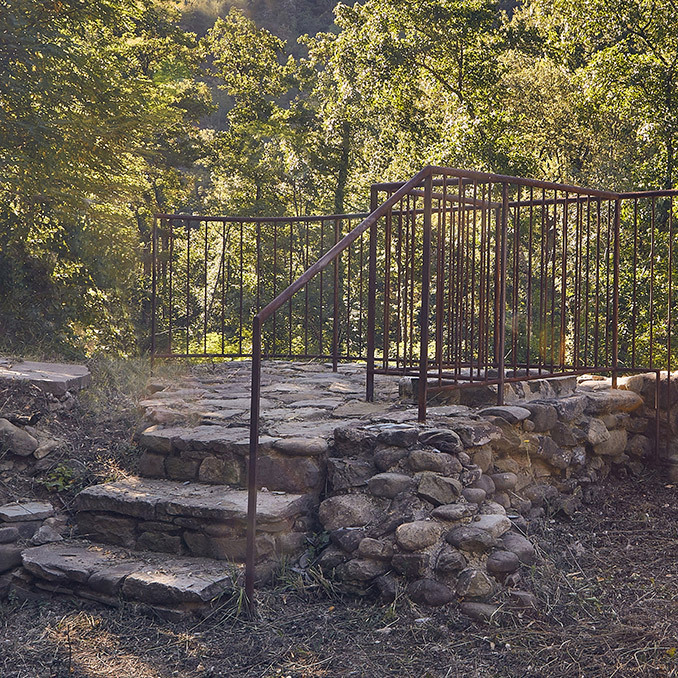 The processing of the extracted metals was done in the Ironworks, built along the Sovara stream by the Granduca of Tuscany; so, it took advantage of the water energy. The large “metalworks plant” extended for approximately 1,200 square meters and had two floors. 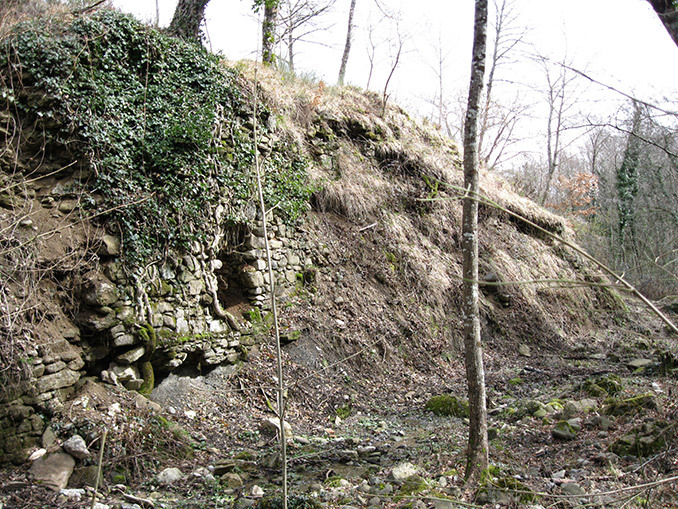 The mining activity stopped at the end of the XVIII century and, consequently, the Ironworks was abandoned. During the 1800s the industrial building was partially demolished to allow a section of the Sovara to be moved: only the part with the well was left visible, but was subsequently damaged by overgrown vegetation (ivy, etc.) and by the river water which eroded the foundations when there was flooding. So, when recovery work started the area was abandoned and the remaining ruins were almost completely covered by soil and vegetation. The Municipality of Anghiari, with the identification of the Park of Monti Rognosi in recent territorial development plans, has promoted the recovery and enhancement of the principal resources present in its area. The site of the old Ironworks and the still existing ruins have been the subject of historical studies and archaeological analysis, that first surveyed the parts above ground through detailed evaluation reports, to then proceed to specific digs: these brought to light other rooms adjacent to the main “original hall”, which were covered with soil and weeds. 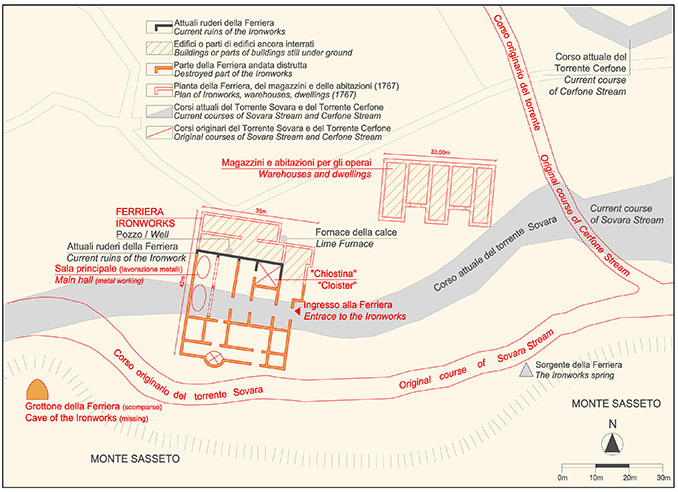 The archaeological area of the Ironworks before the intervention and during the works. (Source: D. Cinti). 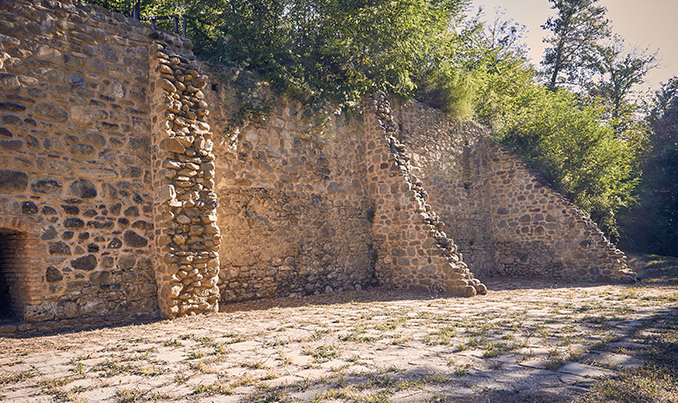 Thanks to the important discoveries it was possible to reinforce the still existing big wall of the “old plant”, on which portions of walls are grafted perpendicularly to it, marking off “two original rooms” and a “small cloister”, that give light to the adjacent spaces and allow the smoke from the processes of melting the metals to exit. The main hall of the ground floor, 12x18m in size, was very important for the old plant. In fact, the historic scheme of the “building” shows two large ellipses in this room that probably were the bases of the melting ovens for working the metals. The recovery work was focused principally on the consolidation of the big transversal wall of the “metallurgic plant” and the recovery of the original well, whose water was available for the various stages of working the metals. The interventions of requalification of the open spaces adjacent to the ruins of the old Ironworks were also important. 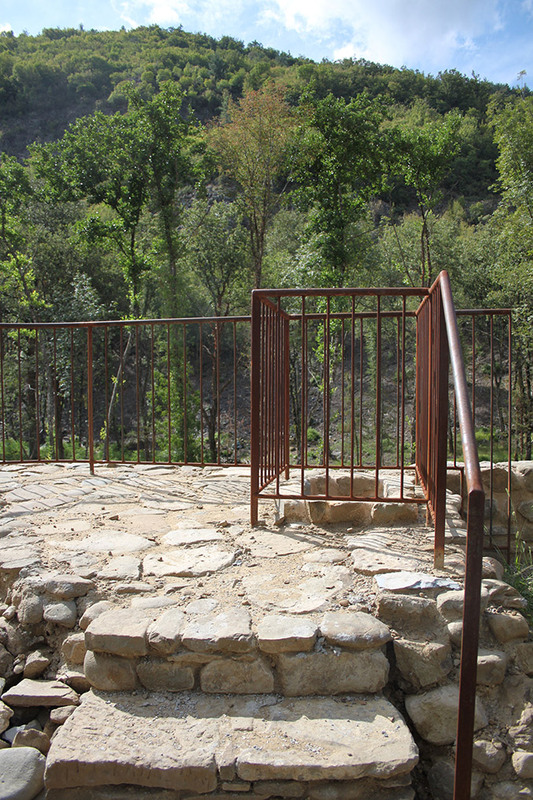 They guaranteed accessibility to the area, its usability and the protection of parts dangerous to the safety of visitors. 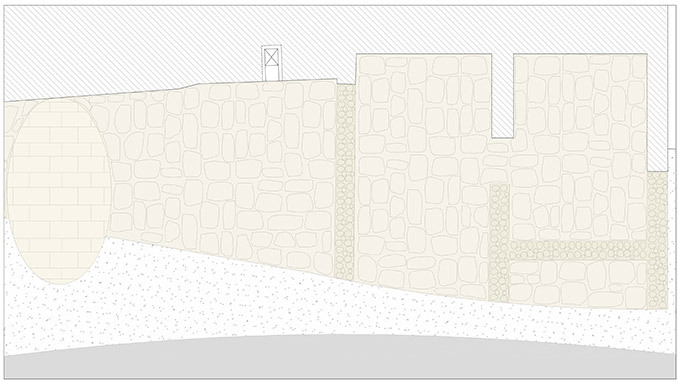 The space facing the “big wall” was in fact paved reproposing in design both the articulation of the original rooms through cobblestone strips, and one of the two ellipses drawn in the historic map, using stone slabs uniform in shape. 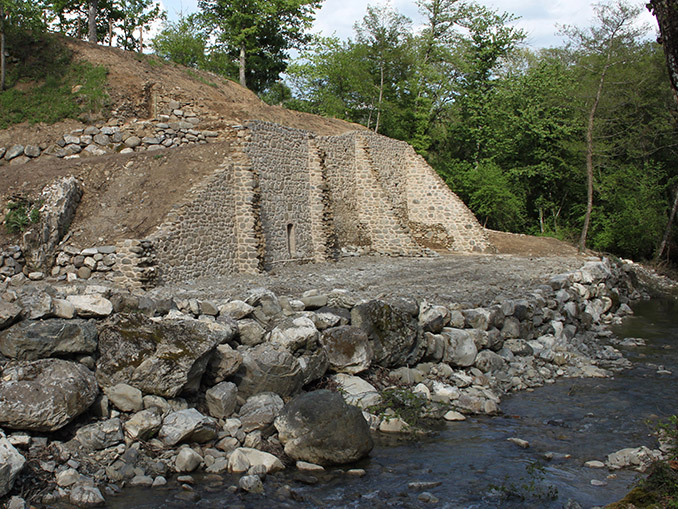 The works also affected the river bank, damaged by the force of the flood waters, using local rocks to reconstruct a levee integrated with the natural surrounding environment. Finally, work was done on the escarpments adjacent to the ruins. 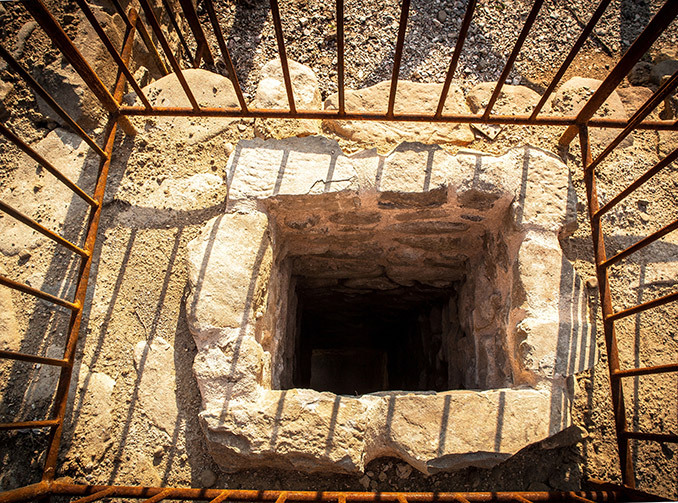 The slope was remodelled, creating a route that goes up to the original second floor of the plant where a small room, maybe used for the forging of metals, was rediscovered as well as another access to the well; thus, it could be used by both the ground floor and the first floor of the old building to take water. 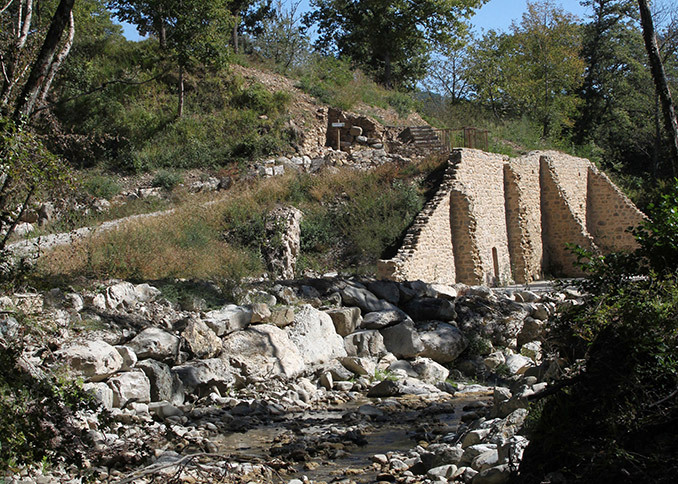 Thus a new synergy between the water and the ruins of the “metal-works plant” was created, capable of intensifying the relationship between the stream water that flowed towards the valley and the static big wall monumentality of the old industrial building: evocation of the close ties that existed between the “iron mill” and the adjacent body of water. Location | Monti Rognosi Nature Reserve, Municipality of Anghiari, Italy.